Today’s small-cap opportunity has a high quality portfolio of projects spanning continents and commodities led by a capable and experienced management team. With projects in both Australia and Colombia, today’s company has interests in markets including copper and zinc, as well as gold. Its immediate focus is on base metal opportunities in the mining-friendly jurisdiction of the Northern Territory. This $4.4 million-capped Aussie explorer, along with its heavy-hitting joint venture partner, the $980 million-capped Sandfire Resources (ASX: SFR), is operating in a world class base metal district at a project in the Northern Territory’s McArthur Basin. This district is home to the largest producing zinc-lead mine in the world in £44 billion-capped London-listed Glencore’s McArthur River Mine. Also in the vicinity is Teck Australia’s world class Teena zinc-lead deposit. Parent company Teck has a market cap of over $13 billion and a sweeping global presence. Suffice to say, across its 1800km underexplored ground package, today’s company is surrounded by those who know how to operate...and operate well. Partnering with Sandfire in a joint venture agreement of which it has operational control and 51% ownership is also a good move with plenty of upside. The potential of this JV is such that it has been recognised by the Northern Territory government as a worthy recipient of funding to assist with the company’s exploration. Specifically these funds will contribute to the imminent diamond drill program. The drill rig is mobilising this week for a program of 5 drill holes for 1500m at three of the company’s prospects where copper and zinc targets have been established and are ready for diamond drilling. With $1.6 million in cash reserves, drilling is fully funded. 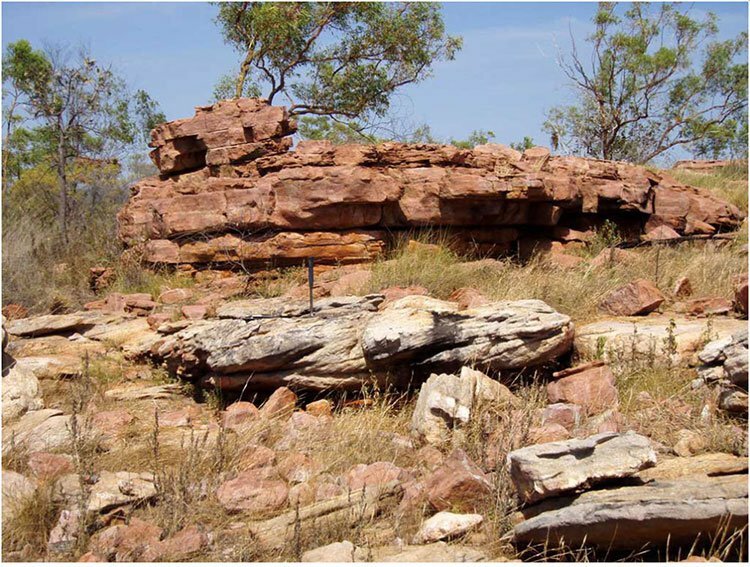 The zinc target occurs in the same stratigraphic rock sequence (Barney Creek Formation) as the world-class McArthur river zinc-lead-silver deposit, and lies along 30km along strike to the west. Diamond drilling is set to commence just days from now to test for major primary copper and zinc-lead mineralisation. Furthermore, significant stratabound copper mineralisation intersected by the company at Coppermine Creek has the potential for a major copper discovery. 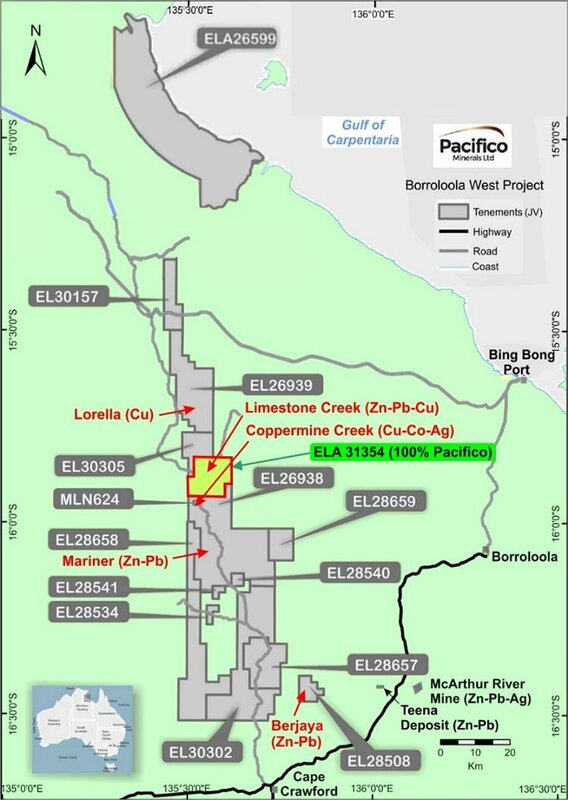 Following the diamond drilling program, an aircore drilling program is planned to commence this field season to test for primary and additional oxide copper mineralisation at the Lorella prospect. As you can see there is plenty of news to come and that’s just from its Australian operations. The company also has multiple high quality projects in the pipeline, including two highly promising early stage gold projects up its sleeve in Colombia, where the company has been operating since 2011. The company’s managing director has history in Colombia. Simon Noon was instrumental in the planning and execution of West Rock Resources’ Colombian strategy before West Rock was acquired by today’s company. Noon built a first class team of industry professionals in Colombia, whilst developing key local relationships and securing all current projects and applications in West Rock’s portfolio. Not only that, but prior to establishing West Rock Resources in 2011, Mr Noon was the Executive Director of ASX listed Groote Resources Ltd, where he managed the company from a market capitalisation of under $5 million to market highs in excess of $100 million. Here’s a man who knows his stuff and investors in today’s company would be hoping for similar results. The Chairman of the Board is Richard Monti, one of the promoters behind junior explorer Azimuth Resources Ltd, which discovered attractively grading gold in Guyana prior to its takeover by Troy Resources Ltd. Also on the Board of Directors is Panoramic Resources co-founder and MD Peter Harold. While the Northern Territory is consuming much of the company’s immediate attention, its Colombian assets add considerable depth and longevity to the company’s portfolio of assets. 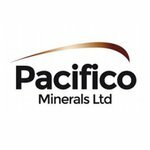 Western Australian based Pacifico Minerals Ltd (ASX: PMY) has a number of projects across Australia and Colombia, exploring for basket of commodities including gold, copper, and zinc. PMY’s current central focus is on progressing the Borroloola West Project in the Northern Territory. This project, a JV with mining powerhouse Sandfire Resources , is prospective for base metals (copper, Zinc, lead), manganese and iron ore. It’s superbly located near one of the world’s largest producing zinc-lead mine, the McArthur River Mine. And just this week PMY announced that diamond drilling is set to begin at the project, with the drill rig mobilised and ready to go on Friday. The nearology of the project and the high-profile JV partner make PMY’s ambitions in the McArthur Basin attractive enough on their own. Yet we can add to that the impressive rally in the zinc price over the past two years. 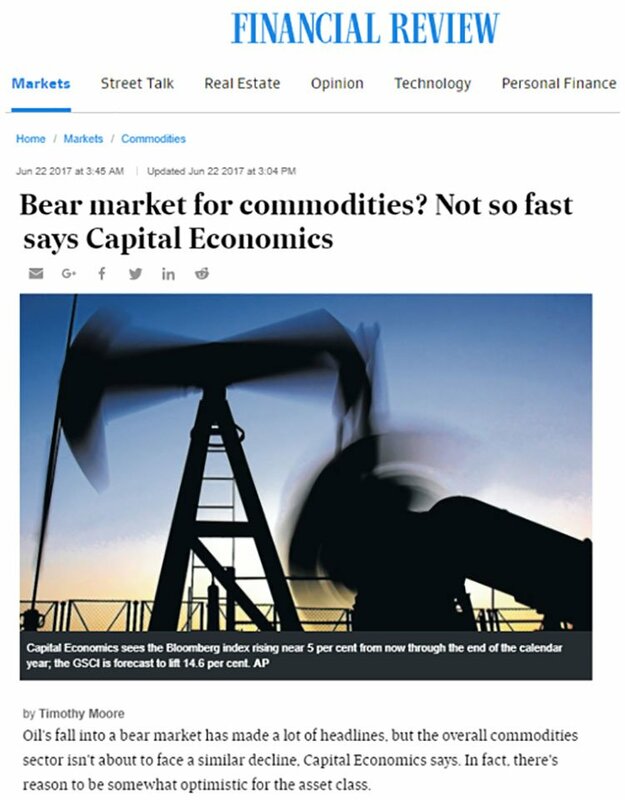 It should be noted that commodity prices do fluctuate and caution should be applied to any investment decision here and not be based on spot prices alone. 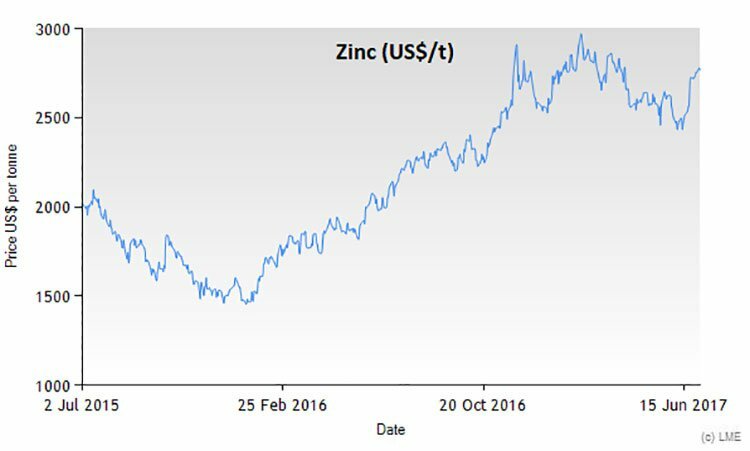 Taking a closer look at the supply-demand dynamics for zinc, it seems that this price rally still has some way to go. As the fourth most consumer metal worldwide, zinc rallied an impressive 63% in 2016, and while it hasn’t got off to such a great start in 2017, inventories are depleting and the world’s largest consumer of zinc, China, has begun working on a one trillion dollar road project, which should certainly increase demand. Macquarie expects there to be a 650,000-tonne zinc shortfall this year and sees prices breaching $3,000 a tonne by the fourth quarter of 2017. 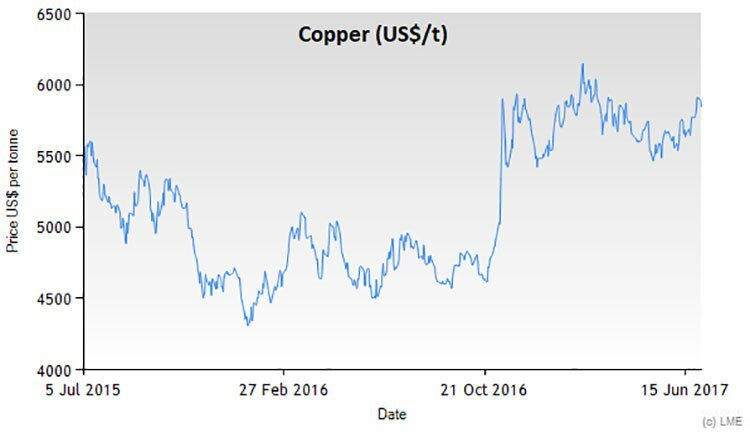 Again, commodity prices do fluctuate so seek professional financial advice before making an investment decision based on these prices. While zinc and copper at Borroloola West is PMY’s primary focus right now, its portfolio includes some other impressive assets. PMY has two gold projects in Colombia in its commodity-diverse portfolio of assets — its Berrio Gold Project and the Natagaima prospect. We’ll get back to the company shortly, but first let’s see what’s happening at Borroloola West in the McArthur Basin. The Borroloola West Joint Venture consists of 12 exploration licences and one mining licence over 1,817 square kilometres. The parties to the JV are 51% PMY and 49% Sandfire Resources. The project lies west and northwest of Teck Australia’s zinc-lead resource at the world class Teena deposit, which is near Glencore’s world class McArthur River zinc-lead mine. On August 7, PMY updated the market with news that a diamond drill rig is being mobilised for a programme to begin on Friday of five drill holes for 1,500 metres at the Coppermine Creek, Mariner and Berjaya prospects. These prospects are part of the JV with Sandfire and are 51% owned by PMY. Drilling is expected to take one to two months to complete with assay results expected over the next three months. That means plenty of newsflow to grab the market’s attention. Potential investors should note that PMY is still in early stage exploration mode and therefore any decision with regards to adding this stock to your portfolio should be taken with caution and professional financial advice sought. Coppermine Creek is situated 100km north-west of the McArthur River zinc-lead-silver mine. The target at Coppermine Creek is Mount Isa Copper style deposit. Significant stratabound copper mineralisation has been intersected at the prospect with immediate potential for a major discovery. Copper mineralisation can be observed at surface as outcropping gossans with malachite staining over a strike length of at least 1.5 kilometres based on drilling, recent geological mapping and sampling. RC and diamond drilling by PMY and previous explorers, has produced results including 30m @ 1.1% Cu in RC hole GPR07 and 34m @ 0.5% Cu in RC hole GPR091. 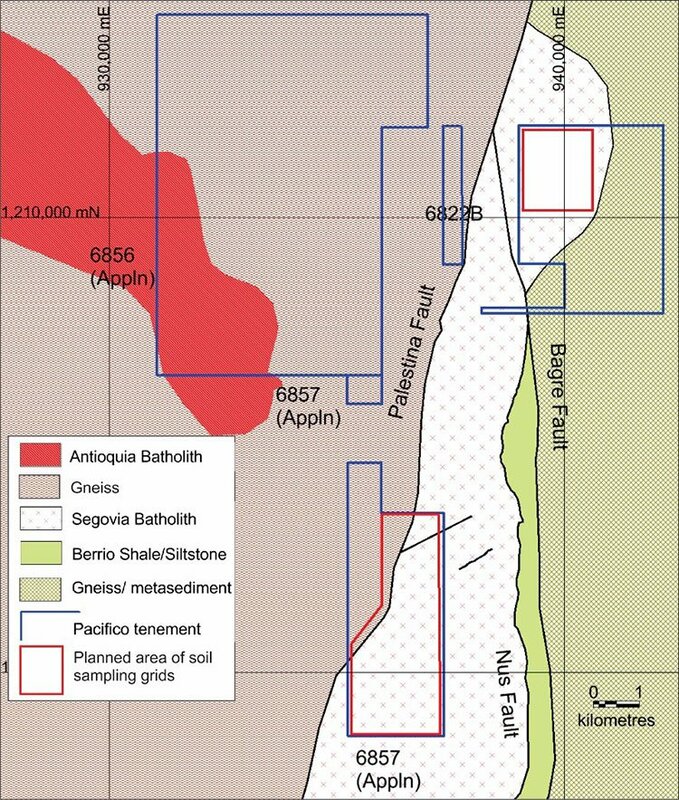 Massive sulphide veins with high copper grades have been intersected by previous drilling in a thick horizon within the Amelia Dolomite of intense fracturing, brecciation and alteration. A ground electromagnetic (EM) survey has been recently completed over part of the prospect. Conductivity profiles confirm the 3D geological model, built up from projecting previous drilling information of gently dipping, bedding replacement, stratabound copper mineralisation beneath 200-250 metres of flat lying dolomitic siltstones. 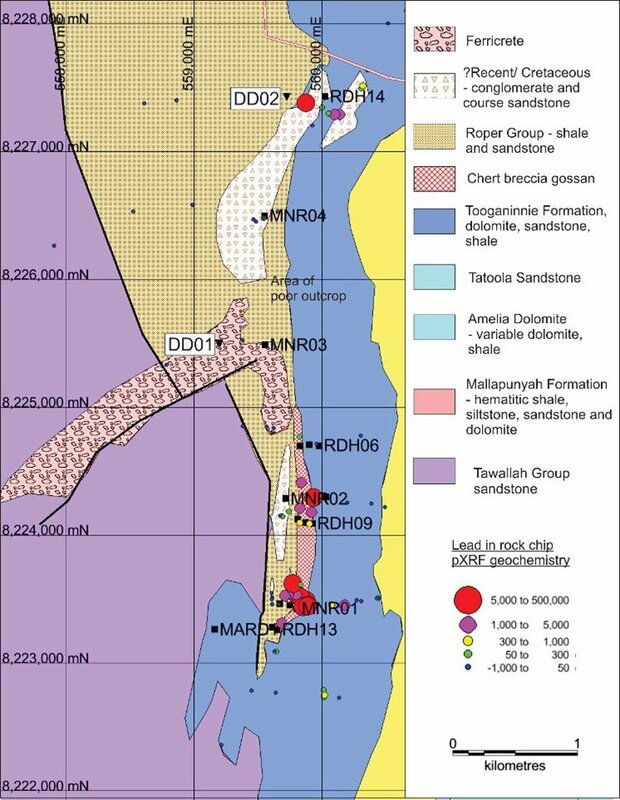 The diamond drill program is planned to test for extensions of stratabound mineralisation within the Amelia Dolomite. Lead-zinc mineralisation was intersected by PMY during drilling in 2016 at the Mariner prospect, which lies south of Coppermine Creek. PMY has established diamond drill targets to test for McArthur River style stratiform zinc mineralisation (i.e. 200 million tonnes of >12% Zn + Pb). 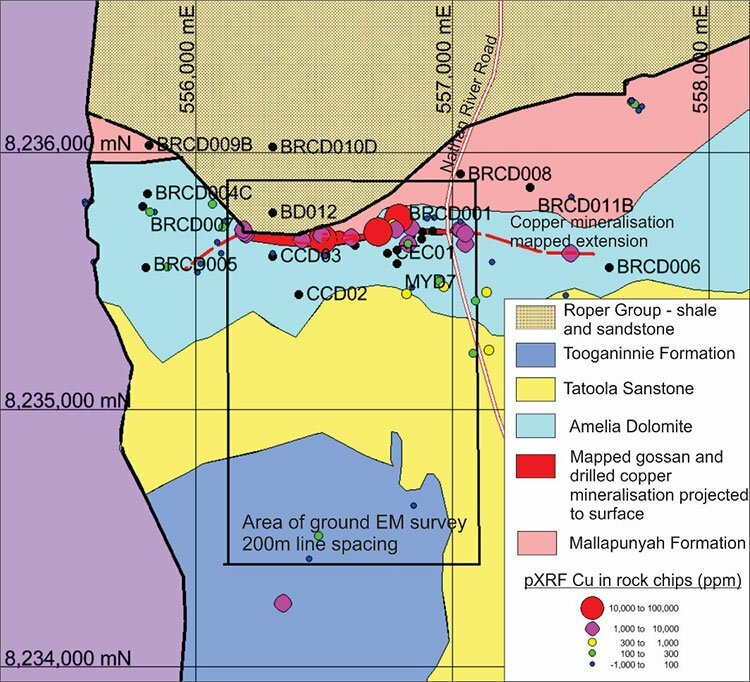 PMY’s mapping and previous RC drilling suggests there is significant oxidised lead mineralization — with some zinc and copper, at the base of the Roper Group. Geological mapping and portable X-Ray Fluorescence instrument (pXRF) reconnaissance geochemistry of float and outcrop was extended northwards over the area considered to have room for the development of significant mineralisation beneath the younger Roper Group sediments. Diamond drill targets (2 holes x 300m) are designed to test the McArthur Group sediments beneath the Roper Group in the northern part of the prospect area. The drill target at Berjaya is to test for a McArthur River style stratiform zinc deposit. 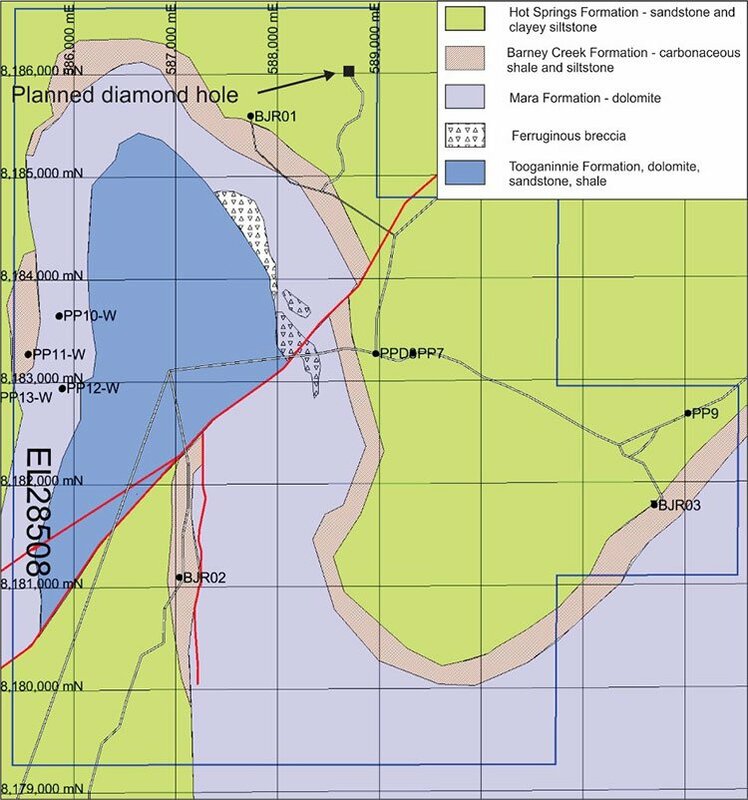 One diamond drill hole is planned to test a Versatile Time Domain Electromagnetic conductive horizon that appears to correspond to the position of the overall gently dipping Barney Creek Formation beneath the Hot Springs Formation. On June 22, PMY announced that it had secured co-funding from the Northern Territory Government for three of its copper and zinc drill targets. The State Government’s the Geophysics and Drilling Collaborations Program will provide the funding to cover 50% of the planned direct drilling costs up to a maximum value of $165,000 at the Mariner, Berjaya and Coppermine Creek Prospects at Borroloola West. The funding program is part of the Creating Opportunities for Resource Exploration (CORE) initiative, which aims to increase the intensity of exploration drilling and geophysics in the Northern Territory. This co-funding, along with PMY’s capital management, means PMY looks to have sufficient cash for operations, including the upcoming drilling program. In addition to the Coppermine Creek, Mariner and Berjaya prospects, the Lorella prospect is part of PMY’s JV with Sandfire. A planned aircore (AC) drilling program at the prospect will explore for both primary and oxide copper. On top of that, PMY has Limestone Creek (ELA 31354), which is held outside of the JV agreement and is 100% owned by PMY. The target here is stratabound zinc-lead mineralisation in the Amelia Dolomite. RC drilling is planned, although a licence must first be granted before PMY can get started. With so much going on at home, you’d be forgiven for thinking that was PMY’s lot. However, you’d be sorely mistaken. The company also has interests in Colombia. With rich mineral endowment, Colombia is an established producer of gold, nickel, oil and emeralds. That said, there has been limited exploration in the country over the past 40 years, so that less than 5% of the country has been explored using modern exploration techniques and technology. 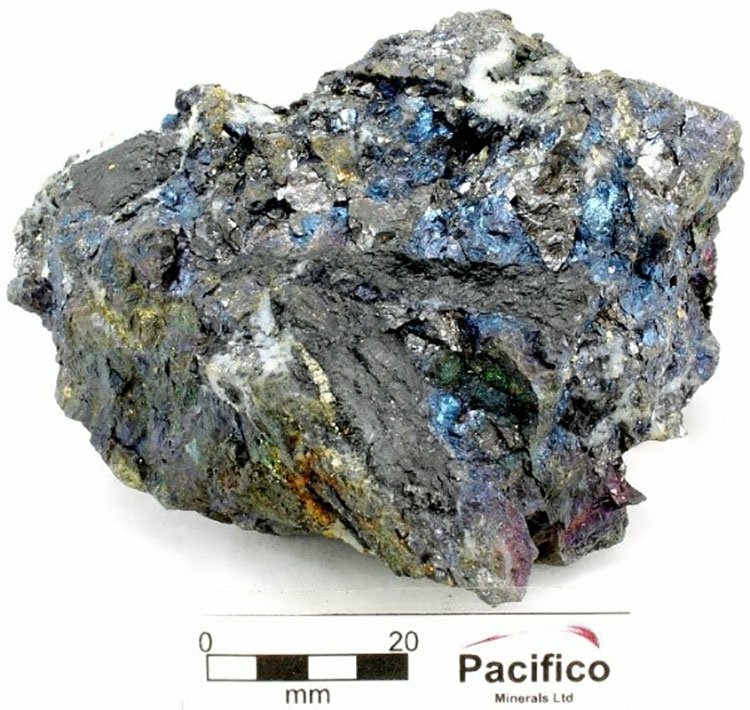 The Andean mountain chain is host to numerous and diverse metal deposits, yet remains significantly underexplored in Colombia. 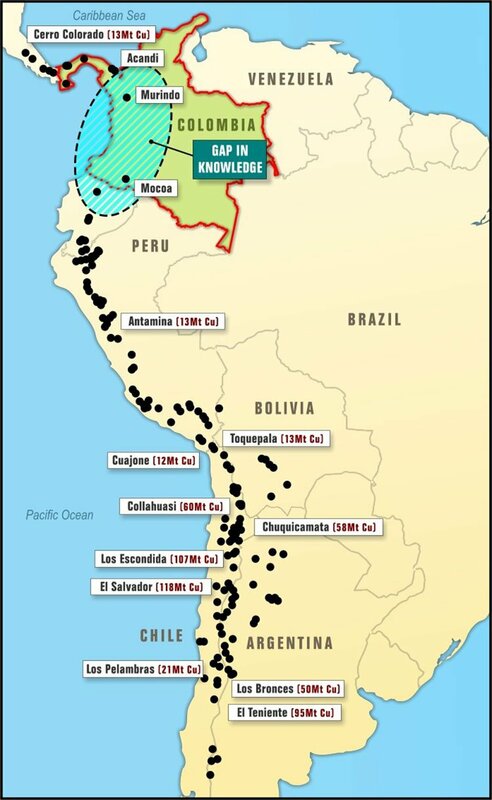 As can be seen on the map below, there are a large number of Major Andean porphyry copper deposits and mines with contained metal elsewhere along the mountain chain. What’s changed over the past decade, is that Colombia has opened up as a highly appealing mining destination, following a significant improvement in the country’s security. The government is also actively encouraging foreign (mining) investment with favourable mining royalties and a low corporate tax rate. And PMY is not going in as a canary in the coal mine. A number of major resource companies are already operate in Colombia, including industry heavyweights such as A$130 billion BHP, £49 billion Glencore, £18 billion Anglo American, and US$3.7 billion-capped Anglogold Ashanti. PMY already has valuable in-country experience, having operated in Colombia since 2011. The company’s position in Colombia since that time allowed for the opportunity to identify and evaluate a range of exciting precious and base metal prospects. As ground became available through the lifting of a moratorium on exploration licence applications, PMY lodged several high quality tenement applications ahead of its rivals. PMY now has tenement applications for five projects totalling more than 46,000 hectares, which are under review by the Colombian Ministry of Mines. These tenement applications are associated with highly prospective geological terrains including the Choco Porphyry Copper Belt, the Middle Cauca Porphyry Belt, and the Antioquia Batholith. Additionally, new project generation and prospect evaluations ongoing. Its pipeline of quality projects in Colombia includes the Natagaima prospect, which is highly prospective for precious and base metals, and the Berrio Gold Project, situated within the prolific Segovia gold belt. 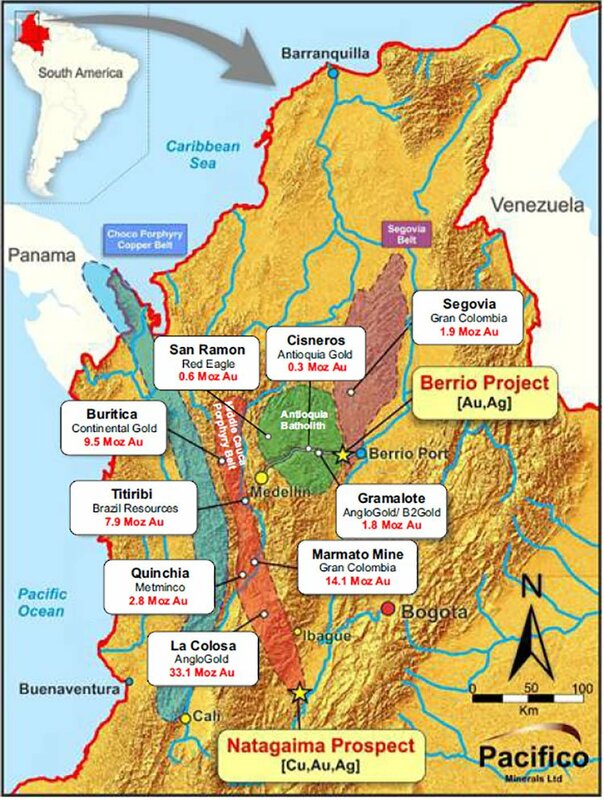 PMY’s Berrio Project is situated within the southern part of the prolific Segovia Gold Belt, from which several million ounces of gold have been produced over the past 150 years, and the eastern side of the Antioquia Batholith, host to a number of significant gold deposits. The project is 35km from the Magdalena River which is navigable to the Caribbean Sea and has excellent infrastructure in place including hydro power, sealed roads, a water supply and telecommunications coverage. The potential for significant gold deposits in the Berrio district is recognised for large vein and stockwork systems hosted by the Antioquia and Segovia Batholiths. Major identified gold deposits in the Segovia Batholiths include Gran Colombia’s Segovia Mine, located about 100 kilometres north of Berrio. It produces 126,000oz of gold per year and has resources of 1.6Moz gold. Historically, five million ounces of gold were p r oduced from the Segovia–Remedios District. In the Antioquia Batholith, AngloGold Ashanti and B2Gold JV’s Gramalote deposit has a current resource of 143Mt of 0.4g/t gold for 3.7 Moz gold. In 2014 and 2015, PMY assessed the prospectivity of its then small 62 hectare Berrio Gold Project in the southern part of the Segovia Gold Belt. It recognised that prospective mineralisation extended outside its project’s boundaries. 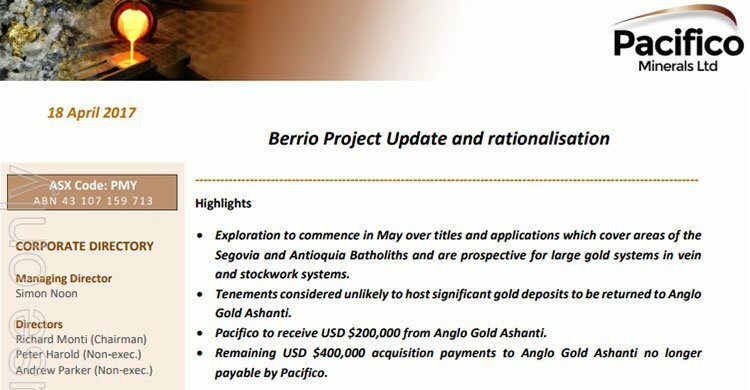 On that basis, in early 2015, PMY expanded its operations, acquiring 100% of AngloGold Ashanti’s interest in ~14,300 hectares of tenements and tenement applications contiguous to PMY’s existing Berrio Gold Project. That said, success isn’t guaranteed and investors should take a cautious approach to any investment decision made with regards to this stock. The local geology has been intruded and is bounded by a fertile granodiorite – a classical and known geological setting for gold deposits. Ongoing geological mapping suggests a series of gold-bearing anastomosing veins comprised mainly of quartz and pyrite within a wider series of mineralised shear zone. PMY see potential to unveil a high grade gold system that features multiple parallel mineralised zones that persist at depth, helped by modern exploration techniques, and are targeting substantial ounces from multiple mineralised veins persisting to depth. In April 2017, PMY provided an update on the project, explaining that exploration would commence the following month over titles and applications covering areas of the Segovia and Antioquia Batholiths and are prospective for large gold systems in vein and stockwork systems. The area covered by PMY’s tenements and tenement applications lies close to the intersection of three major regional faults, the Palestina Fault, Nus Fault and Bagre Fault, and in a district with known significant gold mineralisation. These can be seen in the figure below. The update also explained that tenements considered unlikely to host significant gold deposits will be returned to Anglo Gold Ashanti. As part of the agreement that involves returning these tenements, Anglo will return US$200,000 to PMY. On top of that, the remaining US$400,000 acquisition payment owing to Anglo will no longer need to be paid by PMY. 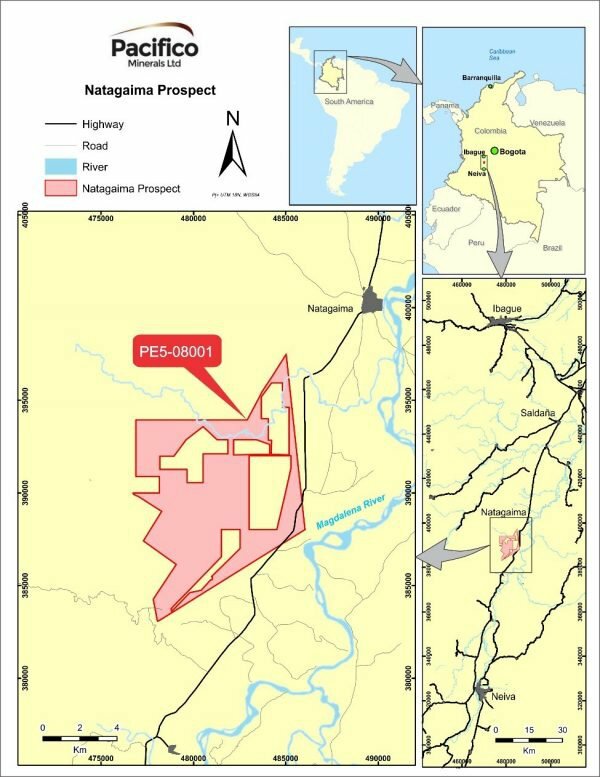 PMY currently has a tenement application over the Natagaima prospect in Tolima, which is prospective for copper, gold and silver. PMY was the first, of many interested parties, to register its tenement application over Natagaima. As Colombia operates a “first right” system with its licence application process, PMY’s ability to get in early could really pay off with initial work indicating prospectivity for epithermal and porphyry style mineralisation. Two mineralised and intersecting trends identified are prospective for precious and base metals. Follow-up exploration programs being considered are targeted detailed mapping, channel sampling of gold bearing quartz veins, map and IP surveys, and trenching. Going forward, PMY is considering several programs for follow-up exploration including, targeted detailed mapping, channel sampling of gold bearing quartz veins, Mag and IP survey and trenching. These will proceed if the Natagaima tenement application is granted to PMY, although this is expected. PMY has expertly positioned itself for longer-term success by taking advantage of the strong copper and zinc market, in addition to its promising gold assets. Yet it’s likely to be its near-term catalysts that get the market talking. As discussed above, a diamond drilling program is set to begin on Friday at PMY’s Northern Territory operations, specifically at Coppermine Creek, Mariner and Berjaya. Following that, aircore drilling is planned to commence at Lorella should PMY see positive results from metallurgical testwork. An update assessing the potential Copper Oxide ore resources with metallurgical testwork on Lorella Copper oxide material is due in the third quarter. Also expected in the third quarter of 2017, is the granting of a new highly prospective 100% owned exploration licence, containing the Limestone Creek prospect. Potential catalysts coming out of Colombia include the granting of the Natagaima exploration licence, which is expected to be received by PMY early 2018. Prior to that, results from the reconnaissance exploration program are expected this month, while the results of Systematic sampling programs should arrive in September. All up, this means there is a huge volume of news due to flow in over the coming twelve months...including plenty of catalysts to draw investors’ attention.